Laura Mercier Eye Canvas EC-3 and Graphic Liquid Eye Liner. Laura Mercier Eye Canvas in EC-3, Graphic Liner in Black Lacquer. Laura Mercier Eye Canvas in EC-3 ($26US/4.8g) is amazing!! It is far superior to my Too Faced Shadow Insurance as a base for eyeshadows. The key is to apply a thin layer on clean eye lids and allow it to dry for a 10-15 seconds before you start your eye makeup. Eyeshadows adhere beautifully to Canvas and last all day without creasing or migration of the color. 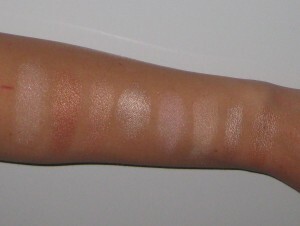 These eyeshadow bases come in five colors to match your skin tone. I prefer Laura Mercier Eye Canvas to LM Eye Basics because it is in glass pot form and paraben-free. Laura Mercier Eye Canvas EC-3 as an eyeshadow base. Color worn in photo after an 11 hour day. Laura Mercier Graphic Liquid Eye Liner in Black Lacquer ($24US) is a very black liquid waterproof liner that will not budge or loose intensity throughout the day. The finish is glossy not matte. Graphic is very easy to apply due to its semi-flexiable felt tip. This liner removes very much like Estee Lauder liquid liner, in that, it peels off when in it comes in contact with your facial cleanser/makeup remover. Some may find it to be a nuisance since it does not come off in one swipe. Graphic will be primarily utilized during hot and humid days. This product is not paraben-free. Laura Mercier Graphic Liquid Liner in Black Lacquer. Makeup would tell you to go and invest in Laura Mercier Eye Canvas (your shade) because every makeup wearer needs this fantastic eyeshadow primer/base. Graphic is an excellent choice for those who do not want to touch-up or worry about their liner fading throughout the day. Laura Mercier Eye Canvas EC-3 and Graphic Liquid Eye Liner are a fantastic combination that will yield a sophisticated eye look. My obsession with this brand has officially reemerged! Thank you Laura for keeping your line classy and fresh!! Au revoir. Be well and stay safe. Laura Mercier Matte Radiance Baked Powder in Highlight 01 swatched heavily and blended out. Laura Mercier Matte Radiance Baked Powder in Highlight 01 ($36US/7.50g) is the only highlighter offered as part of the New Matte Radiance Baked Bronzer Collection. This product is fabulous! 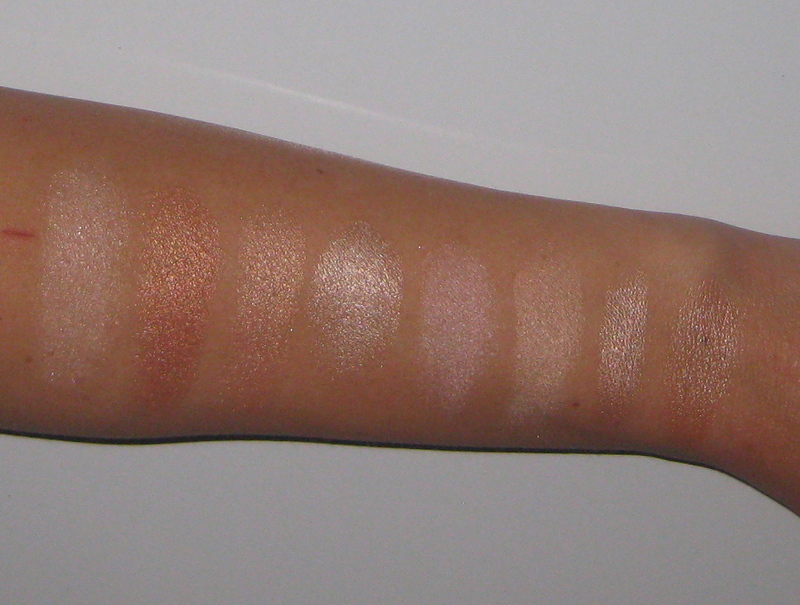 Highlight 01 is smooth, non glittery, can be used wet or dry, and lasts all day!! It gives the skin a refined luminous glow. The beautiful peach/pink hue combination is perfect for both warm and cool skin tones. This powder is also fragrance free and paraban-free. One would use this product in all the usual places; top of cheek bones, inner corner highlight, top of cupid’s bow, down the bridge of the nose, etc.. Laura Mercier Highlight 01 also works very nicely on top of a cream highlighter. It does not cake or get patchy, quite the opposite, it maintains a radiant glow all day long. 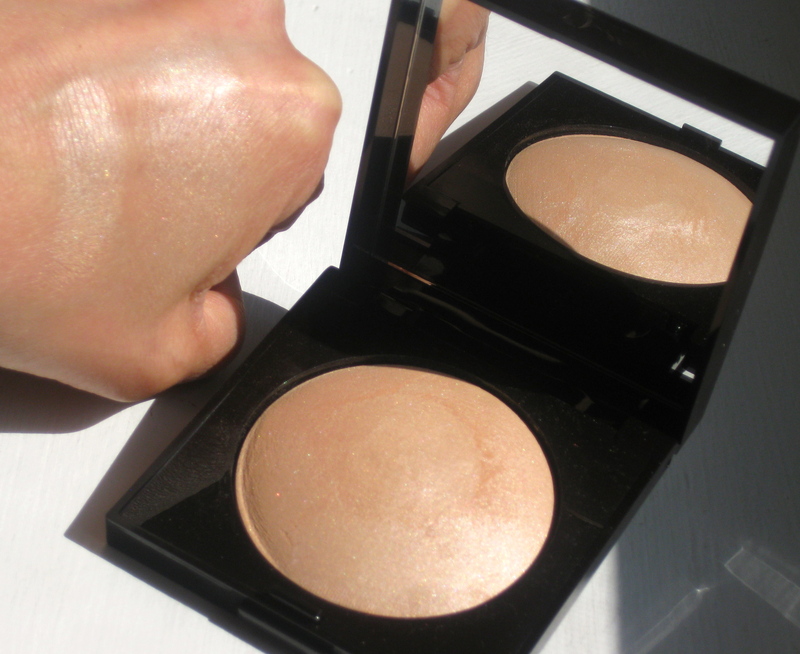 I pair Highlight 01 with my trusty Laura Mercier Baked Bronzer in Ritual; they are my dynamic duo! Laura Mercier Matte Radiance Baked Powder Highlight 01 placed on cheekbones and brow bone. 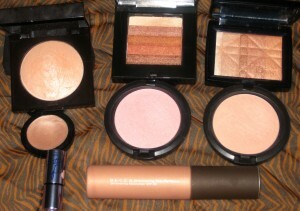 Top Row: Laura Mercier Highlight 01, Bobbi Brown Bronze Shimmer Brick, Dior Amber Diamond. Middle Row: Edward Bess Sunlight, MAC Play-it-Proper, MAC Too Chic. Bottom Row: Benefits Watt’s Up, Becca Shimmering Skin Perfector in Opal. L-R: Laura Mercier Highlight 01, Bobbi Brown Bronze Shimmer Brick, Dior Amber Diamond, Edward Bess Sunlight, MAC Play-it-Proper, MAC Too Chic, Benefit Watt’s Up, Becca Shimmering Skin Perfector in Opal. Laura Mercier Highlight 01 ingredient list. Makeup would say it is very pleased with the new addition to our highlighter family. Laura Mercier Matte Radiance Baked Powder in Highlight 01 is a subtle highlighter that will please the ultimate highlighter fanatic. 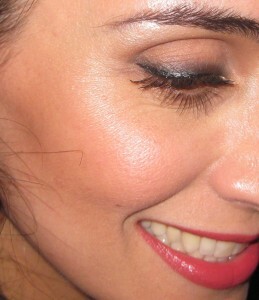 Highlight 01 is not too showy or glittery, it gives off a radiant youthful glow! Will people mistake you for being 20 years younger? Maybe. Remember you are as young as you feel….and I feel 18……Giddy up! Be well and stay safe.